AeroPhoenix Gelflex Crew Tag - Four Colors Available! Durable crew tag suitable for chewing by TSA officers! Clearly identify your luggage as flight crew! Flight Crew, easily identify your luggage to X-Ray screeners! A smart and attractive headset bag! Military pilots demand high quality. It shows in bags by Flyboys! An efficient book bag for the student at a flight school or college. It also makes an excellent messenger/courier bag! Gleim's flight bag is fully functional for in-flight organization and provides quick access to all necessary equipment. 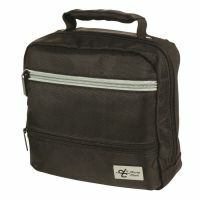 This small duffel-style flight bag is essentially a double headset bag and offers an affordable way to travel in style. An excellent economical headset bag for a single headset, extra pockets. The P3-A02 is Avcomm's best-selling flight bag, meeting the needs of any pilot. Handy tool bag for the small items to carry in flight. A quality leather flight bag at an economical price!